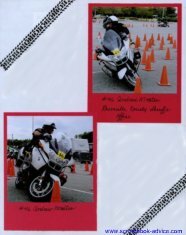 The Palmetto Police Motorcycle Challenge , or Motorcycle Rodeo, was held March 24-26, 2011 in Charleston SC. 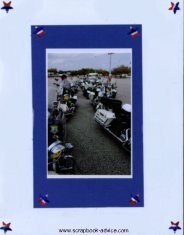 This was the 6th annual event put on by the Charleston County Motorcycle Squad of the Charleston County Sheriff's Office. Check out the events for March 14-15, 2013. 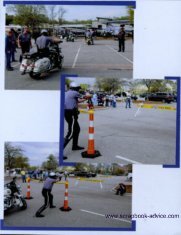 The Rodeo tests and showcases the skills of law enforcement motorcycle riders as they run through a series of courses to gain the maximum potential from their motorcycles. The philosophy is that if you hit a cone while in training, you have just hit a pedestrian. The best of the riders earns the title of Mr. Rodeo, while the best four member team earns the title of Best Overall Team. 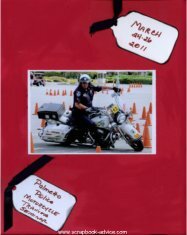 I was asked to put together a scrapbook of this 2011 Motorcycle Competition event for one of it's originators, Rob Grimsley, who was not able to attend this year's event. 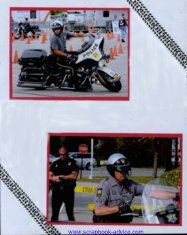 One of the Charleston County Deputies, Don Kjellman, took the photos for me and we had many of Sgt Grimsely's friends sign pages of the scrapbook while at the event. 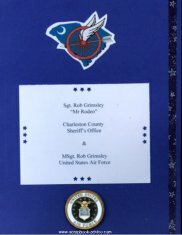 For the front cover I printed the logo from the Palmetto Police Motorcycle Competition and used an Air Force Seal from my stash. 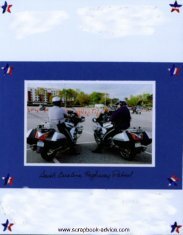 I used Red, White and Blue through this Motorcycle Competition Album and for the bottom border I tore stripes of Red and Blue and attached then to the stripe of white with white star-shaped brads. This decoration wss used on the companion page which is not shown here. On several pages throughout the book I used these a tire tread rubber stamp that I got from Club Scrap Wheel & Sproket Kit. I had been to several of these events in the past, but for this years' event I really felt honored to be so closely involved with some of the organizers of the event and to help out a little. For part of the time I helped with entering the scores for the various rides and also took some scrapbooking supplies with me and cropped some pages while I was between scoring duties. 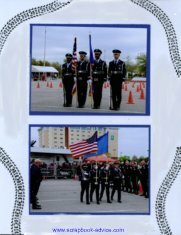 Not a place that I ever expected to be putting together a scrapbook, but Sgt Grimsely's friends spoke so very highly of him and helped me with the photos and writing notes on the individual pages, that it made the entire process very easy. Here I used tags, edged in Navy Ink with Navy Ribbon, to show the Name & Date of the Event. 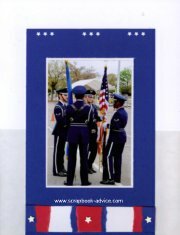 The companion page uses the Navy Blue Ribbon as a side accent. Five courses are run for time and precision with cones placed in certain patterns. Then five additional courses are run. On several pages throughout the book I printed copies of the various course layouts prior to adding mattes, photos or any of the embellishments. 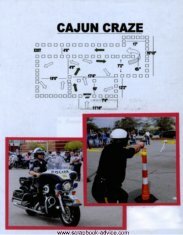 Then a Partner Ride of the Motorcycle Rodeo is a timed run where the two motorcycles are tethered together by a 36" breakaway strap - the successful completion of the course requires that the tether not break. Here's a video on the Partner Ride concept from the 2007 event. 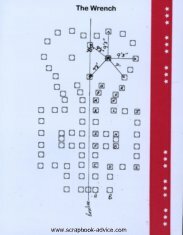 Again, I used the tire track rubber stamp to accent parts of these Motorcycle Rodeo layouts. Another event would be the Individual Slow Ride where the slowest timed run over a course wins. The purpose to demonstrate the manuverability of the motorcycle while keeping it upright. Here's another video on the Slow Ride concept from the 2007 event. There is also a Team Slow Ride. On several pages throughout the book I used some metallic stars of ted, blue and silver for page accents. Additional events would be a Partner Challenge Ride where two officers compete the courses together. 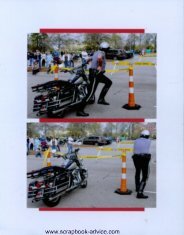 Then a Challenge Ride from the Motorcycle Rodeo where the rider competes with lights and sirens on a new path that has not been practiced. This can involve such tasks as shooting from the motorcycle or throwing a ball to a certain location. The Awards Banquet and Silent Auction was held the last evening where the Trophies were awarded individual riders (Mr. Rodeo) and teams in class of Novice, Intermediate or Expert and depending on the type of Motorcycle ridden. Proceeds from the Silent Auction go to Camp Happy Days that offers comprehensive, year-round support for children diagnosed with cancer and their families. Funds will be used to support their many year-round programs. 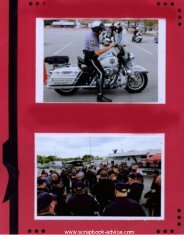 I Hope you enjoyed our Motorcycle Competition Scrapbook and have learned some of what our local heroes do in their off-duty hours to enhance their skills to better serve the public. Come back next year to check out the latest Motorcycle Competition Scrapbook.